I always buy bananas with the best intentions of having one each morning for a healthy, well-rounded breakfast. And then I eat a giant bowl of Lucky Charms. Luckily, over-ripe bananas are perfect for banana bread! I found this recipe on Pinterest. I do love a good ol’ banana bread, but I was excited to try a different take on a favorite. I’ll admit, the frosting was really the selling point! The original recipe called for regular sugar and didn’t include cinnamon. 1) Preheat the oven to 375°F. Grease and flour a 9×13 pan. 2) In a large bowl, mix the sugar, sour cream, butter, and eggs. Stir in the mashed bananas and vanilla extract. Add flour, baking soda, salt, and cinnamon. Then, add in walnuts. 3) Spread batter evenly into pan. Bake 20 to 25 minutes or until golden brown, and the middle is firm when you shake the pan. 4) While the Banana Bread Bars are baking, heat butter in a large saucepan over medium heat until boiling. Let the butter turn a light brown and remove from heat immediately. Add powdered sugar, vanilla extract and milk. Whisk together until smooth. I had to use 4 tablespoons of milk to get it to a spreadable consistency. 5) When the Banana Bread Bars are done, remove from the oven and immediately spread the Brown Butter Frosting over them. This is a treat which requires a glass of milk to consume — rich, and sweet, and delicious! 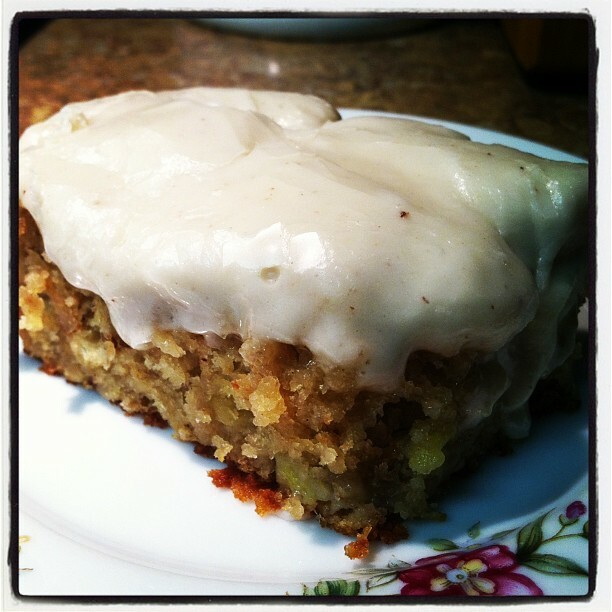 Banana Bread Bars with Brown Butter Frosting. Yes, I know “media” is plural, but the phrase has become a sovereign term — it’s immune to the laws of grammar! In highschool, it was MySpace. In college, it was Facebook. After graduation, it was Instagram and a brief obsession with foodie shots and pictures of my cats. I got an iPhone and downloaded far too many game apps. Curse you, Bejeweled Blitz! How many nights you have ruined my bedtime! After that, I got married, bought a house, and then joined Pinterest. I’m sure my husband and immediate family are thankful it was in that order. After Pinterest, I started a blog. And now, I have finally succumbed to the one social medium I always swore I’d resist: Twitter. 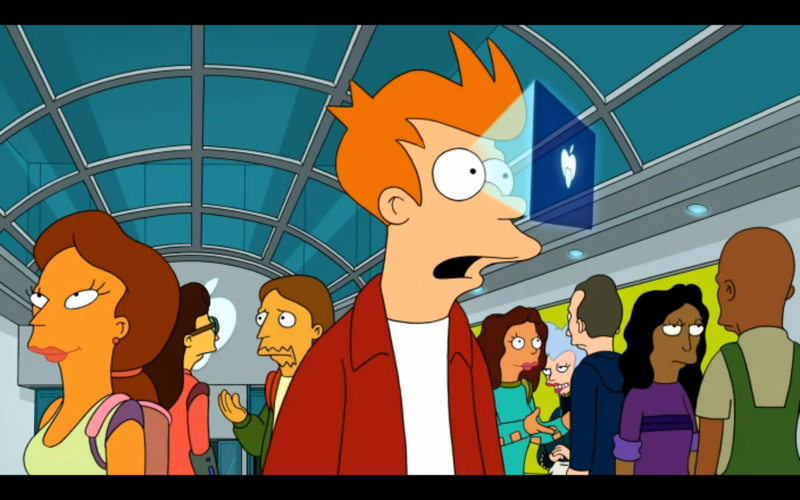 I don’t think I can go much further down the rabbit hole, at least until they invent the EyePhone. I’ll be the first to admit — technology and social media are consuming. You can lose an entire hour in what feels like minutes. You can become that couple in a restaurant on a double date with their smart-phones. You can spend more time tweeting, pinning, and posting about life than actually living it. But at the end of the day, these things are tools, and their merit comes down to application and moderation. The great benefits of technology and social media are creativity and connectivity. These are good things! Like learning about something you never knew existed with StumbleUpon. Creating a website to share your gifts with the world. Staying in touch with family and friends who live far away through Skype dates. Coordinating trips and parties and reunions on Facebook. Networking on LinkedIn. There are a million outlets for art, literature, music, you name it. It is an exchange of ideas and culture that goes beyond physical borders. And as much as we contribute to the conversation by sharing the things that are important to us, reciprocally, we learn from the things that are important to others. In so many ways, this blog has helped me to live a fuller life. It pushes me to contemplate the things I do and consider how they add value to my day. It reminds me to make the most of my time, and to act on my dream projects and ideas. And it encourages me to share my thoughts and experiences so they can inspire others. I’m back! Apologies for the hiatus!! I’ve been busy with work, and road trips, and birthdays, and pulling weeds in my yard. Speaking of birthdays, this recipe goes out to a certain brother-in-law whose love of chocolate rivals my own. I scrapped together what I had in my cupboard, and it turned out pretty darn delicious! Ingredients: Yields 24 large cookies. 1) In a large bowl, combine the butter, egg, and vanilla. 2) Stir in the cake mix, adding heavy whipping cream midway. 3) When the cake mix is completely incorporated, add the chocolate chips. 4) Bake at 350° F for 10-12 minutes. 5) Cool 2 minutes on the cookie sheets, then remove to wire racks. The cookies are really soft and moist. 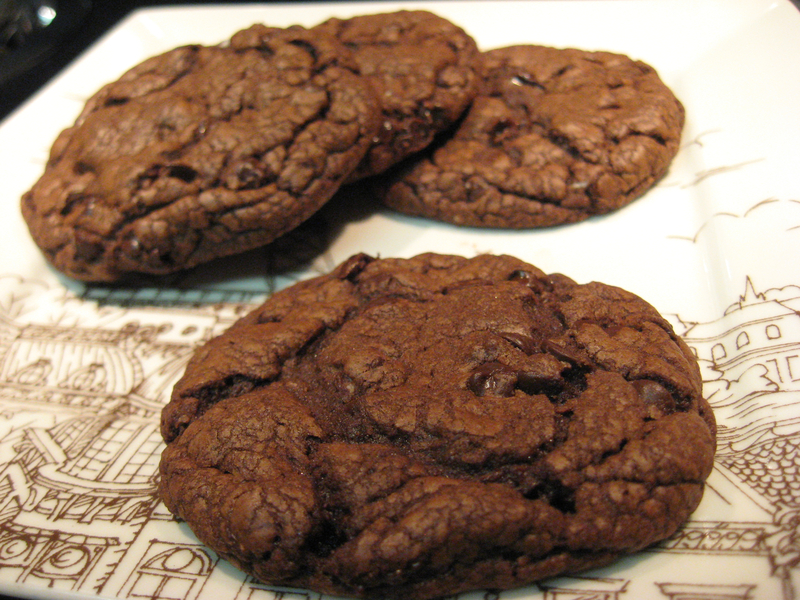 This is a really easy cookie recipe, and I’m so happy with how they turned out!